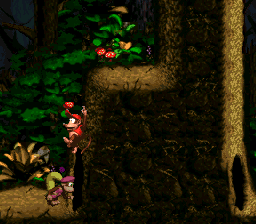 Donkey Kong Country 2: Diddy's Kong Quest is the second game in the Donkey Kong Country trilogy. 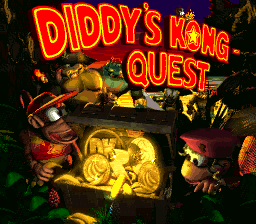 This time, it's up to Diddy Kong and his girlfriend Dixie Kong to save Donkey Kong from Kaptain K. Rool. See if there's any other revisional differences. Diddy and/or Dixie will drop from the top of the map, landing near a DK Barrel. Aside from two nearby Zingers, the level is devoid of any further objects. You cannot enter the cave at the end of the section, as exit data isn't programmed. However, using PAR code 7E0E1000 for Moonjump (jump at any point and as many times as you want) will enable you to get to the other side of the barrier. There are no other objects in the level, but you can also jump over the cave at what is normally the end of the level...to a bunch of random tiles between there and the rightmost border of the level. The entrance. And a DK barrel! The cave can't be entered, but you can see beyond it. The garbled mess beyond the final wall. PAR code 7E061702 enables an option to change the English game text to German...except this doesn't actually work, mainly because the only other language used for the text is French. There's no German text in the European or Japanese versions, either. Still, there was a German release which, as you may have guessed, uses German text. It also has English as the alternate language option. Diddy and Dixie looking rather sad. Judging from their close proximity in the ROM to the victory sprites, these were likely intended to be used for failing a Bonus Game. 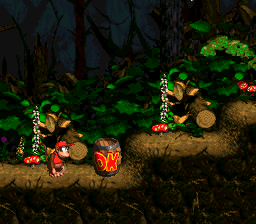 Similar animations were used in Donkey Kong Country when failing the various spelling, shell game and mix-and-match bonus games. Directly after the red and yellow Zinger palettes is this one. 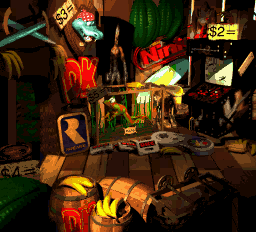 Green Zingers were used in the first Donkey Kong Country, but not here. Aside from the blue and green varieties, Flotsam also has red and yellow palettes. Flitter has four unused palettes, but unfortunately only uses the blue-with-purple-wings variant in-game. These tracks are loaded as part of the Crocodile Cacophony music set used in K. Rool Duel and Krocodile Kore. However, a few checks for this set in the code result in them never being played normally. PAR code B883B52C will allow the death music to be played normally in both K. Rool battles, and B8B3090A will allow the victory themes to play in K. Rool Duel. B8B31300 will do the same as the latter for Krocodile Kore, but it will give you a Kremkoin instead of a Hero Coin for beating the battle the first time. Unknown, but it may have been intended for when a Kong is released from a DK barrel like in the previous entry. An alternate sound for collecting a banana. This exact sound is used in Donkey Kong Country 3 when collecting a banana bunch. This sound should be used when the Kongs are transforming inside an Animal Buddy Barrel. It is even called in the game's code, albeit too late, and on the same channel as the sound of the barrel breaking. Thus, it cannot be heard. It can sometimes be heard when performing the Castle Crush glitch. 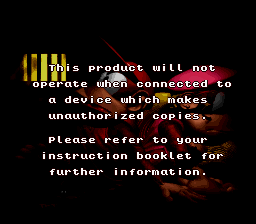 The game contains a much more thorough set of anti-piracy tests than those seen in earlier SNES titles. 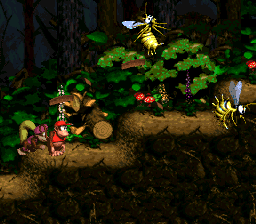 Similar programming is also present in Donkey Kong Country 3 and Killer Instinct. Failing any of the below tests (except the Checksum Verification and Reset Vector Verification) will display the above unauthorized device message on boot up. Behind the scenes, the string A thief! is copied to both $0907 and the beginning of SRAM (battery-backed memory used to hold the save game data). Ten seconds powered off is necessary for the contents of RAM to decay. If these tests fail again on the second boot (using the string saved in SRAM to determine if it's the second try), then the anti-piracy message is shown. However, if the tests pass, the string Rareware is copied to $0907 instead; if this string is detected at startup, the anti-piracy checks are skipped and the game boots normally. At the beginning of a level, a checksum is run on 544 bytes worth of code and data which includes all of the above tests, the PAL/NTSC region check and various initialization routines. If the checksum generated doesn't match the hardcoded value it compares against (i.e., the anti-piracy routines were tampered with), RAM address $7E0AFD, which holds the total number of screens in the level, is decremented by one. This punishes the player by causing the screen to stop scrolling just before reaching the goal in a level. There are two separate checks which punish the player if it detects that the Reset Vector (boot address) was modified (usually meaning the presence of a cracktro). The first check occurs when switching rooms or finishing a level. If the check fails during the former, the player is booted back to the map. For the latter, the next stage will not be unlocked. Animal crates will not break open when jumped on if the second check fails. Present at 3F0000 in all versions of the ROM. The colors of the buttons on the controllers in the game mode selection screen are region-appropriate. North American SNES controllers have purple and lavender buttons, while the European and Japanese controllers use red, blue, green, and yellow buttons. 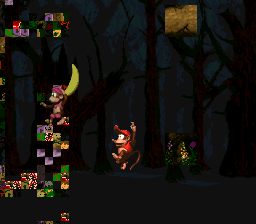 The aforementioned controller change appears in the Monkey Museums. An additional shadow can be seen on the controller in the Japanese and European versions as well. 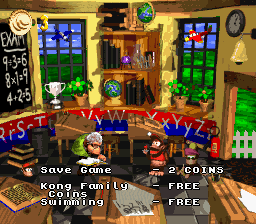 In the Japanese version, saving at the same Kong Kollege again costs one Banana Coin instead of two. 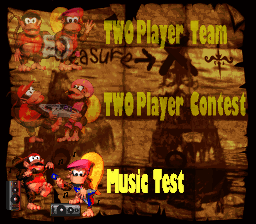 In the SNES version, select an empty file, then press Down, Down, Down, Down, Down when Two-Player Contest is highlighted. The menu will scroll down to the new option, where you can press Left or Right to select the music. 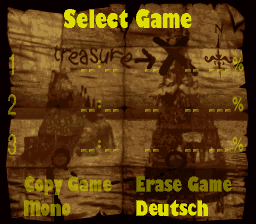 In the GBA version, enter ONETIME in the Cheat menu inside the Option screen to access the Music Test. Note that some music tracks cannot be heard in the music test for the SNES version, but they are available in the music test for the GBA version. Also, the GBA version has several new tracks that are not found in the SNES version at all. 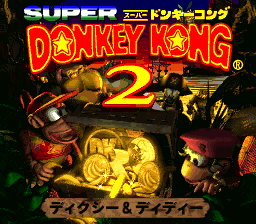 Second note, the SNES music track "Rescue Kong" is not used in the GBA version, instead a modified version of the same track is used, called "K. Rool 2". Most of the titles of the GBA tracks are from the SNES version's official soundtrack, although the track "Stickerbush Symphony" is renamed "Stickerbrush Symphony." It's possible to crash the game in Kreepy Krow by hitting Krow while he's moving up to the next level. The timer on the moving barrel can be disabled by getting hit by an enemy exactly as the timer hits zero. You can then move to the left and scroll out of bounds which causes you to wrap over to the other side of the level. The Virtual Console version makes a change to Glimmer's Galleon. In the SNES version, when the Kongs would change direction, Glimmer would turn around to face the screen; during this time, there would be a blinding flash where the entire screen would turn white for one frame, forcing players to close their eyes. 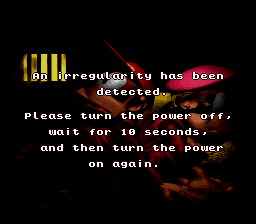 The Virtual Console version removes the flash, reducing the risk of epilepsy.